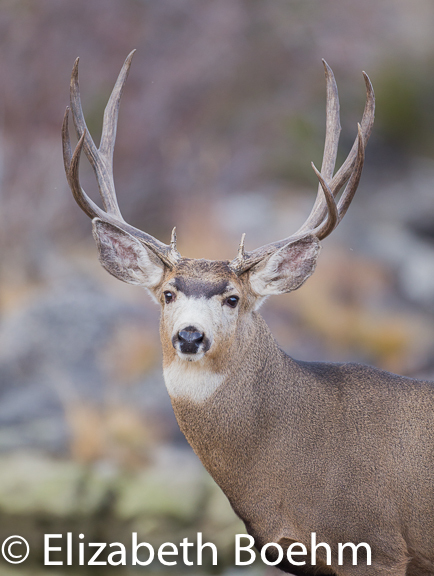 Mule Deer in Wyoming migrate to higher elevations in the spring and summer and head to lower elevations for the winter months secondary to snowpack levels and forage availability. 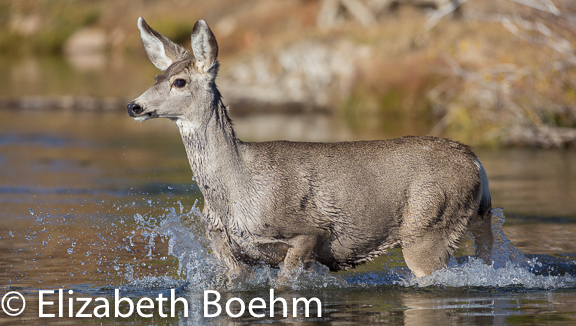 Biologists have recently discovered a portion of the mule deer herd in the Pinedale area is moving 150 miles each spring and fall, which is the longest distance taken by any of our larger mammals. The deer tend to take a specific route, moving in larger groups during the autumn. I worked this migration for a number of mornings in a variety of locations. Sitting in a blind, off of the main trail, and also using a remote camera, they were for the most part oblivious to my presence. I had to be incredibly quiet and at times not move at all until they decided the “camo lump” was harmless. The does were very alert and wary, ready to bolt at any suspected danger. The bucks were starting to enter their rut-minded world and would react only if the does spooked. While photographing the bucks coming through, I had to keep one eye on the lead doe and be very still if she suspected anything! 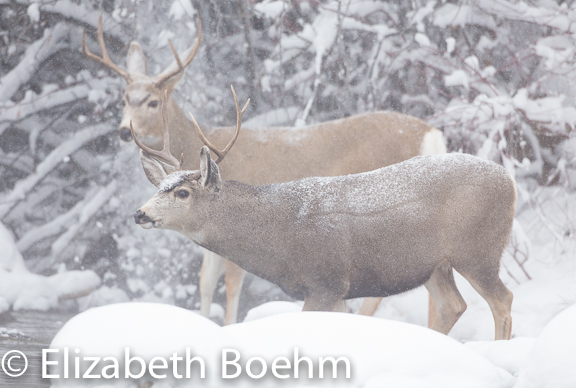 This was not always easy, especially when several bucks were posturing their dominance to each other. The deer face numerous obstacles on their migration route and I scouted out migration trails prior. I would then set up in areas in which numerous deer would filter through each morning. 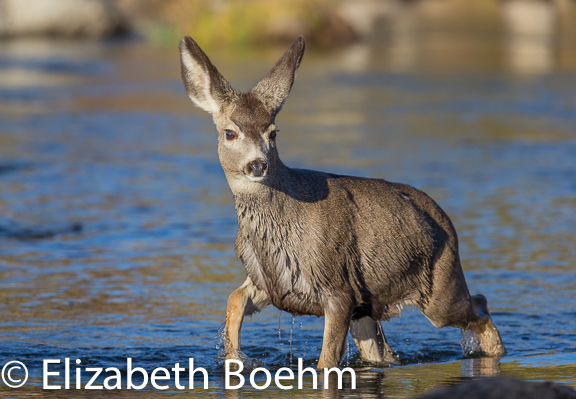 I learned a lot about mule deer through all of this. Does and fawns would stick together, calling out to each other frequently, and if a fawn lost it’s mama, the bawling would begin. On numerous occasions a fawn of the year would leave the herd and turn around crying loudly until it found it’s mother who was lagging behind the main group. This was always a bit distressing to me until I realized the two had been reunited. One particular fawn crossed the river four times, crying very loudly in distress, until it finally headed in a southward direction. In another moment a very, small fawn was lagging behind the group and it was touching to see the doe waiting for her little one to catch up; vocalizations between the two keeping them in touch. The migration has slowed down considerably from the several hundred coming through each morning earlier in the month. I will still sit on the now snow packed ground and try to catch a few deer lagging behind. 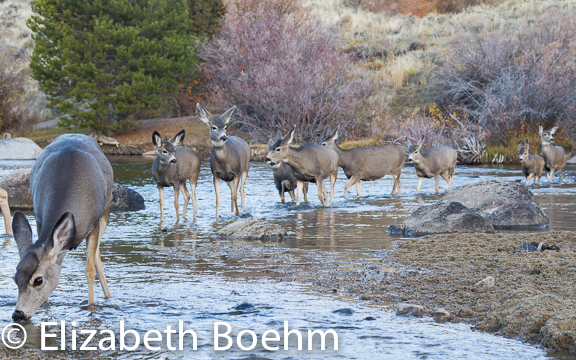 It has been a fun and exciting fall watching and photographing these large ungulates as they move through the area to their wintering grounds.